THE Mail on Sunday has axed star columnist Tina Weaver after a Byline Investigation exposed her criminal past as a phone hacking mastermind, it has emerged. Management at Britain's biggest mid-market weekend publication did not know the full extent of former Sunday Mirror editor Weaver's shadowy background - until they read our stories, according to insiders. 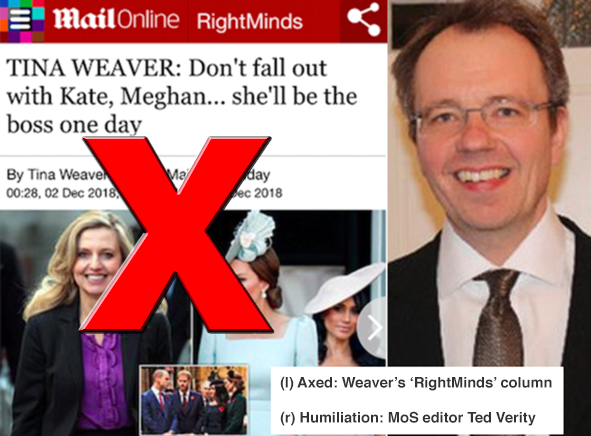 And now, editor Ted Verity has been forced to drop Weaver, less than two months after making her his first high-profile appointment since taking over the paper in September. A source said: "This is already being seen as a humiliation for Ted Verity and leaves a big question mark on his judgment. The decision to get rid of Weaver was made by the paper's top executives last Saturday. "When they hired her, they knew there were some skeletons left over from her years at Mirror Group Newspapers (MGN). But until Byline's stories came out, they did not know the full extent of Weaver's involvement in the phone hacking scandal. "It was abundantly obvious they had scored a big own goal. Reluctantly, but inevitably, they had to let her go." At the time of writing, the Mail on Sunday had not responded to our requests for comment on Weaver's departure. It did however deny a separate January 1 Byline Investigation (left) about emails which show the paper's former executive Chris Anderson was receiving transcripts of actor Sadie Frost's emails in 2006, insisting: "These allegations are totally unfounded". This evening, a spokesman for Press reform pressure group Hacked Off said: "The scandals and cover-ups over phone hacking and illegality at some of the largest newspaper groups in the UK, which continue to play out to this day, have exposed how the corporate governance structures at some of these publishers are rotten to their core. “The news that Tina Weaver, herself heavily implicated in illegal activity at the Mirror Group, had been reshuffled from one publisher mired in corporate illegality, to another which is facing its own allegations of criminality, showed just how much of an insular and mutually protective mentality persists at these newspaper groups." Weaver's employment is understood to have ended after we sent the Mail on Sunday a series of questions last Friday (January 4) about stories she had written in their pages and online about the private lives of people she is also known to have had under unlawful surveillance while at her previous employer. These included queries about risk assessments and concerns about attracting aggravated legal actions from Weaver’s past victims, and the theoretical risks the MoS was accepting by giving Weaver a roving brief to comment on such people’s private lives. We also asked whether the Mail on Sunday gets clearance from its own lawyers before writing about people she targeted, given the legal actions against MGN have now cost her last employers £80m - and rising - in costs and damages. And then last Sunday, Weaver's 'RightMinds’ column disappeared. The Mail on Sunday refused to say whether the situation was temporary, permanent, or in any way linked to the phone hacking operations Weaver directed at Mirror Group Newspapers (MGN) between 2001 and 2010. However, our series of articles on the findings of Britain’s top privacy judge, Mr Justice Mann, about the unlawful activities of Weaver and her senior newsroom team, prior to her joining the MoS in November, 2018, had indeed struck home. We told how Justice Mann, in a devastating judgment for MGN, only recently released in full, found Weaver to not only have been personally involved in the unlawful eavesdropping practice, but to have given "wrong" evidence - under oath - to the Leveson Inquiry. 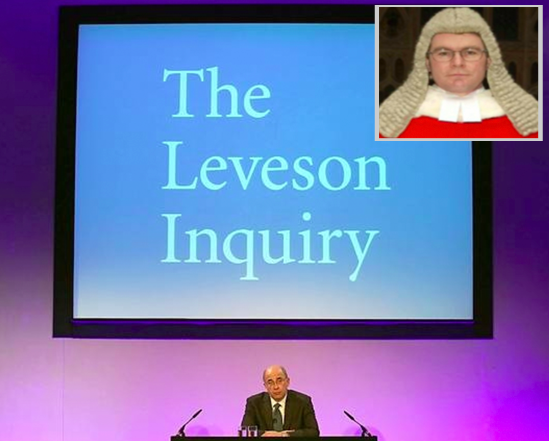 Justice Mann said: “In evidence given to the Leveson Inquiry Ms. Tina Weaver, then still editor of the Sunday Mirror, denied knowledge of phone hacking or even of gossip of it. Among hundreds of victims, from all walks of life, of an industrial scale phone hacking operation overseen by Weaver are a growing number whose private lives she has also written about for the Mail on Sunday. But she has not told the million-a-week-selling paper’s readers - or the police - that she conspired to unlawfully access the voicemails of some of them. Last week, for example, Weaver wrote about the return of Cold Feet, an ITV drama series first made popular in the 1990s, and which elevated many among its cast into household names. Byline Investigates revealed that alongside being an avid armchair fan, Weaver was also instructing her journalists to help themselves to the confidential private information of actors James Nesbitt, John Thompson - along with his real-life wife Samantha, now divorced - and Helen Baxendale. They were joined, among others, including their non-celebrity friends and associates, by entertainer Anthony McPartlin and ex-wife Lisa Armstrong, Hollywood star Gwyneth Paltrow and her former spouse the Coldplay singer Chris Martin, David and Victoria Beckham, and the entertainer Cheryl Cole. During Weaver’s editorship, the Sunday Mirror published stories about their private lives. Among them was a front-page story about the marriage difficulties of James Nesbitt, authored by Weaver’s former trusted news executive James Weatherup - a journalist later convicted in a separate phone hacking conspiracy at the News of the World. Other front-page stories delved into the Beckhams' marriage in 2004, while the romance between Paltrow and Martin was, from 2002, also a source of constant fascination for Weaver’s newsroom, as were the day-to-day activities of McPartlin, and by extension his ex-wife Armstrong. Justice Mann’s high court ruling was based on evidence contained in internal Sunday Mirror emails, financial paper trails, and the explosive testimony of whistle-blower Dan Evans, a news reporter who Weaver trained to be the paper’s in-house hacker. Evans spoke of his time working under Weaver in an exclusive interview with Byline TV. The judge found that Sunday Mirror journalists, at Weaver’s instruction and sanction, routinely used shadowy private investigators and phone hackers to illegally monitor hundreds - and potentially thousands - of people of interest to her newspaper. Describing how Weaver directed the hacking, and worried it might be uncovered, he said: “Mr Evans received clear instructions from Ms Weaver about the need to cover his tracks for these unlawful activities. Justice Mann also told how Weaver feared her paper’s activities, ranged as they were on Members of Parliament, among many others, might alert the domestic security service MI5. The Mail on Sunday’s appointment of Weaver to one of its most prominent editorial positions came shortly after Tory Minister Matt Hancock made a unilateral decision before Parliament to cancel the second part of the Leveson Inquiry, which would have re-examined Weaver’s earlier evidence in light of the High Court findings. 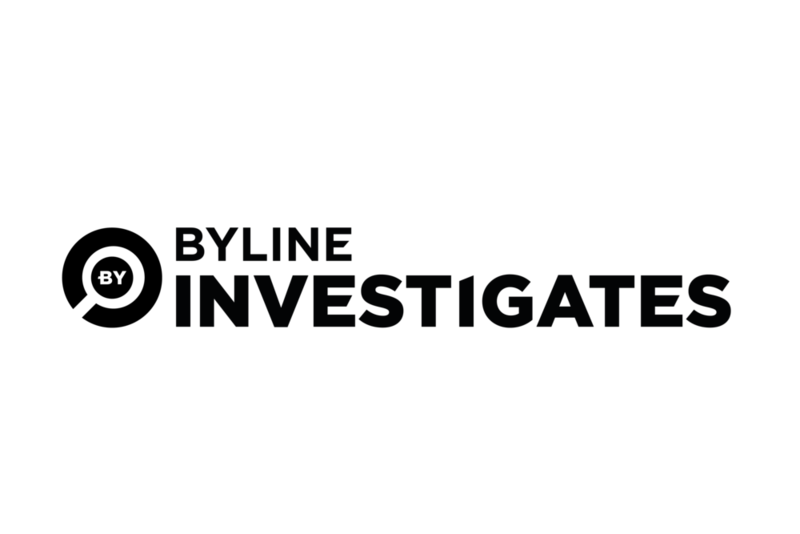 Byline Investigates has asked the Metropolitan Police whether it would be acting on the evidence presented in our stories, which appear to show Weaver breached both the Inquiries Act and committed perjury, an offence punishable by up to seven years’ jail, but at the time of writing no investigation had been opened.